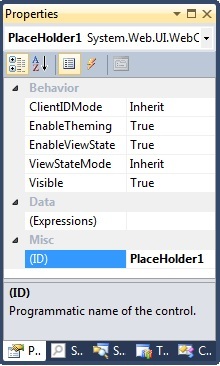 ASP.NET PlaceHolder Control is not like other standard ASP.NET controls. It has not user interface and doesn't produce any HTML output on client side. PlaceHolder control is invisible for website's visitors. Still, it is the one of very important controls on the Visual Studio toolbox, especially useful if you create dynamic user interface. PlaceHolder control, just like its name says, holds place for other controls, without producing its own visible output. Drag PlaceHolder control from toolbox and place it somewhere on web form. Grouping like this enables easier manipulation with logical parts of web page. For example, let say you want to show newsletter form only to members who are not on your email list yet. In this case, we can use PlaceHolder.Visible property to not show newsletter form if member is already subscribed. If Visible property is set to false, all child controls will also not be visible. This can improve user experience, save some bandwidth and speed up your page load. PlaceHolder control is pretty basic, inherited directly from Control class, not WebControl like others. Thus, it doesn't have many properties. In most cases, you just need ID and Visible properties. Very often question is how to resize the area where PlaceHolder shows child controls. But, PlaceHolder doesn't have an option to resize because it doesn't exist at run time. There is nothing to resize. If you want to manipulate the area where child controls are shown, you can place one <div> tag inside PlaceHolder. So, you can manipulate child <div> tag and set any of its styles properties. However, better solution in this case is probably to use Panel control instead of PlaceHolder. Panel control works like PlaceHolder, but it has additional styles properties which can be used to define size and other styles on web form. On this way, state of controls inside of PlaceHolder will be persistent between two postbacks. Use Page_Load to set default values, but only if not page post back. Without this condition code will set default values after every request and practically delete any user input. More about page life cycle you can read in ASP.NET Page Life Cycle tutorial. Both Panel and PlaceHolder control can be used as container for other controls. Using of both controls is same. Dynamic controls can be added on same way, by using Controls.Add method, and retrieved back with Controls.FindControl method. There are some differences too. Panel control is heavier than PlaceHolder control. At run time, PlaceHolder is rendered as nothing. PlaceHolder is simply replaced with its child controls. There is no HTML output, not even simple <span > tag. On the other hand, Panel control is rendered as div tag in most cases, in some cases as span tag and even as HTML table with single cell for ASP.NET 1.1 in old browsers. 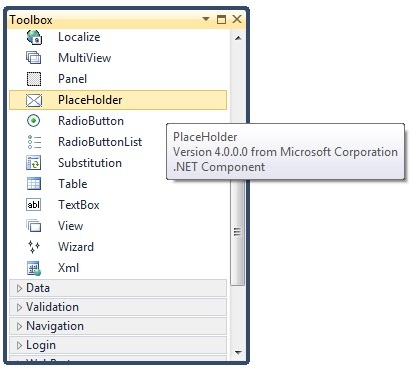 Note that PlaceHolder is inherited from Control class, while Panel is inherited from WebControl. Because of this, Panel has more properties which you can use to define control's width, height, default button, align text, background image, border, CSS class and all other style attributes. Which is better, Panel or PlaceHolder depends of your project requirements. For example, if you want to define dimensions and styles of PlaceHolder, you can do it by inserting <div> tag first. But, in this case it is probably better to use Panel control which already has needed styles properties. One more advantage of PlaceHolder control over Panel control is that PlaceHolder can be placed anywhere on page. 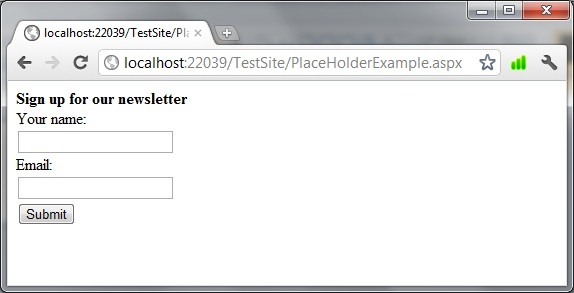 Panel must be placed inside of ASP.NET web form tags, but you can PlaceHolder inside of <head> tag too. One more advantage of Panel is that allows editing in design view. You can add static content to PlaceHolder in code view only. But, content of Panel control can be edited in design view too, which is easier if you try to design some nice looking user interface. At first sight, Literal Control looks like one more alternative to PlaceHolder control. It is light weight and has Controls.Add method. However, if you try to add some control, you will get "'System.Web.UI.WebControls.Literal' does not allow child controls." exception. Still, Literal control can be an option if you need to display static text or HTML code, without adding of server controls. I hope that PlaceHolder control looks more familiar to you after reading of this tutorial. 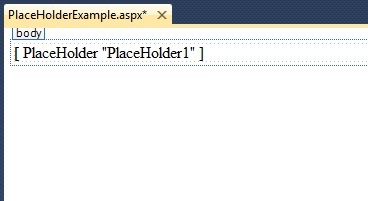 As you can see, PlaceHolder is very simple control, but it plays important role in ASP.NET developement. Controls.Add and Controls.Find are two most useful methods when work with PlaceHolder. In addition to these, you can use Clear method to remove all controls from collection. There are also AddAt, Remove and RemoveAt which give more options to manipulate with Controls collection. As possible alternatives to PlaceHolder, you can use Panel if you need CSS styles, defined dimensions or DefaultButton property, or LiteralControl if you just place static text or HTML.